While at the grocery store today, I noticed a new cheese product in the dairy aisle. 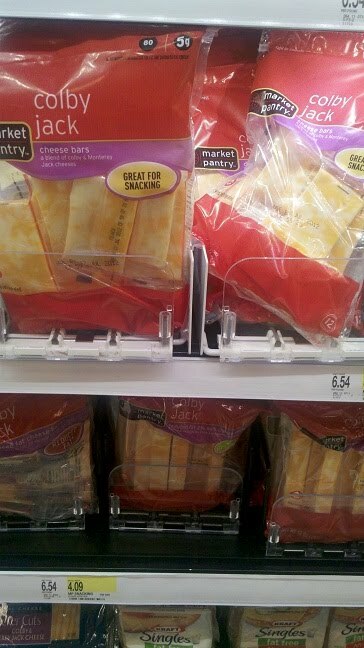 Apart from the usual shredded, block and sliced cheese, the store now offers "cheese bars," which is something between a cheese block and a cheese slice. Upon closer examination of my photo, the store also offers cheese sticks (a skinnier version of the cheese bar) as well. I found myself oddly attracted to these products: I like cheese, I like to snack, and sometimes I like to snack on cheese. At the same time, it is hard to understand the place of cheese chunks in the market -- especially next to the cheese block that consists of exactly the same type of cheese. After all, the only inputs you need to make cheese bars and cheese strips are a knife and a cheese block... and a little time. It is possible that the very people who would buy cheese bars and strips are those people who place a very high value on their time (or estimate the amount of time it would take to cut the cheese to be very high). Consequently, they're willing to pay a higher markup for segmented cheese. In economics lingo, segmenting the market by pre-cutting the cheese allows the cheese firm to screen customers into price sensitive (those who would go through the hassle to cut their own cheese) and price insensitive (those who appreciate pre-cut cheese). This is valuable to the firm because it allows for price discrimination. Charge a higher markup on pre-cut cheese (disproportionate to its additional cost) and price discrimination can be profitable. The one technicality here is that the firm must prevent arbitrage -- resale or repackaging of the blocks into bars and strips. As long as a big enough group of people is unwilling to cut their own bars and strips, cheese arbitrage shouldn't be an issue. For more on this topic, there's an excellent set of three (1, 2, 3) YouTube videos on Price Discrimination.